The RSD-10 Pioneer (Russian: ракета средней дальности (РСД) «Пионер» tr. : Raketa Sredney Dalnosti (RSD) "Pioner"; English: Medium-Range Missile "Pioneer") was an intermediate-range ballistic missile with a nuclear warhead deployed by the Soviet Union from 1976 to 1988. It carried GRAU designation 15Zh45. Its NATO reporting name was SS-20 Saber. Its deployment was a major cause of the NATO's 'Double-Track Decision', which led to the deployment of more medium-range nuclear weapons in Western Europe. The RSD-10 was withdrawn from service under the 1987 Intermediate-Range Nuclear Forces Treaty. The missile was 16.5 metres (54 ft) high, 1.9 metres (6.2 ft) in diameter and weighed 37.1 tons. It was based on two solid-fuel fibre-glass clad stages of the RT-21 Temp 2S (SS-16 Sinner) so it was also known as the RT-21M Pioneer. The missile's range was from 600 to 5,000 kilometres (370 to 3,110 mi) initially; the final model had a maximum range of possibly 7,500 kilometres (4,700 mi). Initially the missile was fitted with a single 1 Mt, 1.6 ton warhead, later models could take one warhead or two and from 1980 three MIRV'd 150 kt devices (Pioneer UTTH). The CEP was also reduced from 550 metres (1,800 ft) to 150 to 450 metres (490 to 1,480 ft). The missile was the first Soviet missile equipped with solid fuel instead of liquid fuel, which meant that it could be launched once the order had been given instead of wasting hours doing the dangerous work of pumping the missile with liquid fuel. It was intended to replace, or augment, the R-12 Dvina (SS-4 Sandal) and R-14 Chusovaya (SS-5 Skean) missiles deployed from 1958 and 1961 respectively in the USSR and Warsaw Pact states. It entered the development stage in 1966 and a design concept was approved in 1968 and the task given to the Moscow Institute of Thermal Technology and Alexander Nadiradze who also developed the RT-21 Temp 2S in the same period. Flight testing began in 1974 and deployment commenced on 11 March 1976, with the first supplied units becoming operational in August of that year. Up to 1986 a total of 48 launch sites, including a site at Pavschino, were equipped with 405 RSD-10 missiles under control of the Strategic Rocket Forces. Some in the United States such as Richard Perle saw the SS-20 as a part of a bid for global power on the part of the Soviet Union. 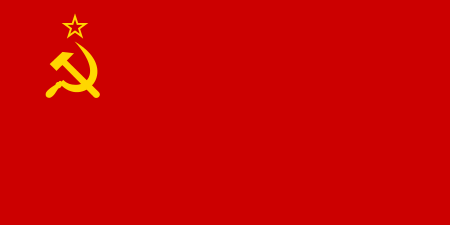 Another popular theory held that the SALT treaties, by placing quantitative limits on long-range missiles, had encouraged the Soviets to place more emphasis on medium-range missiles, which were not covered by SALT. Another theory held that the SS-20 was the "son" of the failed SS-16 ICBM project. Following the failure of the SS-16, the Soviets simply used the technology and parts that had been developed for the SS-16 for the SS-20. 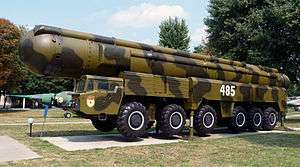 Others argued that the SS-20 was part of an attempt on the part of the Soviet military to develop a more sophisticated nuclear strategy that did not call for an all out nuclear first strike as soon as World War III began by giving the Soviets a second strike capability that they had previously lacked. During the 1960s, Soviet missile procurement was dominated by the ideas of Defence Minister, Marshal Andrei Grechko who was opposed to the idea of nuclear weapons as a weapon of last resort, and planned that if World War III began to begin that conflict with an immediate nuclear strike on the NATO nations. By the early 1970s, Grechko's views had caused opposition within the military and the political leadership, who wanted the Soviet Union to have a second strike capacity in order to prevent a war with the United States from going nuclear immediately as Grechko preferred. More importantly, the increasing influence of Marshal Dmitriy Ustinov heralded a shift in Soviet thinking about nuclear weapons. Ustinov was a man closely connected with the various Soviet design bureaus, and who generally sided with demands of the design bureaus against the military regarding weapons procurement. The decision to order and introduce the Pioneer in the mid-1970s was in large part due to Ustinov's wishes to shift military procurement out of the hands of the military and into the design bureaus, who in turn pressed for more and varied weapons as a way of increasing orders. The British historian James Cant wrote that it was the triumph of the Soviet version of the military-industrial complex over the military as regarding weapons procurement that was the most important reason for the Pioneer. On 10 August 1979 the tests of the modernized "Pioneer"-UTTKh (15Zh53) began on the Kapustin Yar test site. They continued through 14 August 1980, and on 17 December 1980 the missile designated as SS-20 Mod3 was deployed. This variant had the same propulsion system as earlier versions, but due to upgrading of a command structure and instrumentation-service unit it was possible to improve accuracy (CEP) from 550 to 450 meters, to increase maximum range by 10%, and to increase the area covered by the warheads. This latest RSD-10 variant subsequently received NATO reporting name SS-28 Saber 2. Arguably, the Warsaw Pact enjoyed in Central Europe a massive conventional superiority over NATO. Soviet leaders assumed that NATO would use tactical nuclear weapons to stop a massive Warsaw Pact offensive. The RSD-10 provided the Soviet Union with an in-theater "selective" targeting capability that it previously had lacked. The RSD-10 had the capacity to destroy all NATO bases and installations with negligible warning. Thus, the Soviet Union acquired the capability to neutralise NATO's tactical nuclear forces with surgical nuclear strikes. ↑ Cant, James "The SS-20 Missile-Why Were You Pointing at Me?" pages 240-253 from Russia War, Peace and Diplomacy edited by Ljubica and Mark Erickson, London: Weidenfeld & Nicolson, 2004 page 241. ↑ "RSD-10 Mod 1/-Mod 2 (SS-20)". Missile Threat. Retrieved 23 December 2014. ↑ Cant, James "The SS-20 Missile-Why Were You Pointing at Me?" pages 240-253 from Russia War, Peace and Diplomacy edited by Ljubica and Mark Erickson, London: Weidenfeld & Nicolson, 2004 page 243. 1 2 3 4 Cant, James "The SS-20 Missile-Why Were You Pointing at Me?" pages 240-253 from Russia War, Peace and Diplomacy edited by Ljubica and Mark Erickson, London: Weidenfeld & Nicolson, 2004 page 244. ↑ Cant, James "The SS-20 Missile-Why Were You Pointing at Me?" pages 240-253 from Russia War, Peace and Diplomacy edited by Ljubica and Mark Erickson, London: Weidenfeld & Nicolson, 2004 page 245. ↑ Cant, James "The SS-20 Missile-Why Were You Pointing at Me?" pages 240-253 from Russia War, Peace and Diplomacy edited by Ljubica and Mark Erickson, London: Weidenfeld & Nicolson, 2004 pages 245-247. ↑ Cant, James "The SS-20 Missile-Why Were You Pointing at Me?" pages 240-253 from Russia War, Peace and Diplomacy edited by Ljubica and Mark Erickson, London: Weidenfeld & Nicolson, 2004 page 247. ↑ Cant, James "The SS-20 Missile-Why Were You Pointing at Me?" pages 240-253 from Russia War, Peace and Diplomacy edited by Ljubica and Mark Erickson, London: Weidenfeld & Nicolson, 2004 pages 250-251. 1 2 Cant, James "The SS-20 Missile-Why Were You Pointing at Me?" pages 240-253 from Russia War, Peace and Diplomacy edited by Ljubica and Mark Erickson, London: Weidenfeld & Nicolson, 2004 pages 251-252. ↑ "RT-21M / SS-20 SABRE - Russian / Soviet Nuclear Forces". Retrieved 23 December 2014. ↑ "INF Theater / Operational Missiles - Russian / Soviet Nuclear Forces". Retrieved 23 December 2014. ↑ ISN Editors. "Poland reveals Warsaw Pact war plans". International Relations And Security Network. Retrieved 23 December 2014. ↑ Michael Holm, 23rd Guards Missile Division, accessed July 2013. ↑ Nick Hansen (4 May 2012). "North Korea's New Long-Range Missile – Fact or Fiction". 38 North. Retrieved 12 April 2013. Cant, James "The SS-20 Missile-Why Were You Pointing at Me?" pages 240-253 from Russia War, Peace and Diplomacy edited by Ljubica and Mark Erickson, London: Weidenfeld & Nicolson, 2004 ISBN 0-297-84913-1. This article is issued from Wikipedia - version of the 9/12/2015. The text is available under the Creative Commons Attribution/Share Alike but additional terms may apply for the media files.